PC gaming parts are constantly getting more powerful, efficient, and affordable, which is making the PC platform a very serious rival of consoles when it comes to living room gaming. Especially since the release of the Pascal GPUs some months ago, which virtually enabled seamless 4K gaming with a single card, the number of users investing in a living room gaming PC has been increasing significantly. When it comes to living room gaming PCs however, size is a very important factor and may even outweigh that of the cost. A large PC tower is rarely a feasible option, with users demanding small and elegant designs that match the aesthetics of a modern living room. With many reputable manufacturers offering products specifically designed for living room gaming PCs, the selection of a proper case and peripherals is not an issue. The selection of internal components however can become an ordeal, as compact cases often have numerous limitations. In order to conserve space, either in order to make the design even smaller or to make room for other components, many compact case designs are nowadays making use of SFX power supply units. It would be impossible a few years back to power a powerful gaming system with an SFX PSU, but more recent designs are making use of more efficient energy conversion platforms and components, allowing them to reach power outputs that were unheard of for SFX PSUs a few years ago. 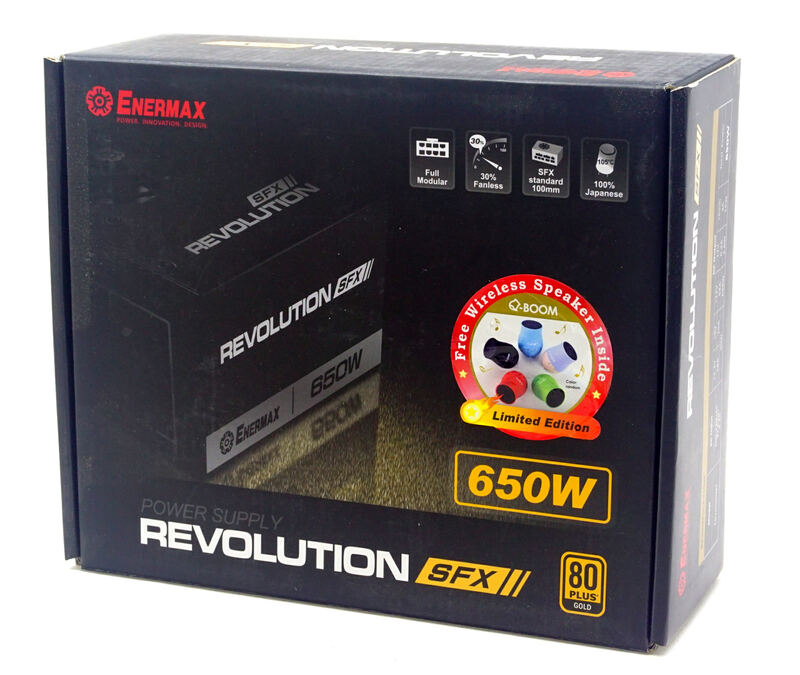 This year several manufacturers have released high output SFX designs, and Enermax is one of the most prominent names. The company announced the Revolution SFX units back in December, highlighting their cost-effective design and full SFX compatibility. The Revolution SFX units are available in just two variations, the ERV550SWT and the ERV650SWT, with a maximum power output of 550W and 650W respectively. In this review we are having a close look at the more powerful 650W version. Enermax went with a minimalistic, dark design for the packaging of their SFX PSUs, with icons highlighting its most important features. The thick walls of the cardboard box and the polystyrene foam pieces inside offer more than ample shipping protection to the small unit. Inside the box we found a luxurious bundle that we rarely encounter even with top tier products. Enermax supplies a typical manual, four black mounting screws, a SFX to ATX adapter for the installation of the PSU in an ATX-compliant case, two long and two short cable management straps (one of each is red and the other is black), and finally a “limited edition” Bluetooth speaker (the color is random). The small speaker is not very powerful or clear, but it is an interesting (if unusual) small gift to have. Enermax went with a fully modular design and every cable can be detached, including the 24-pin ATX cable. All of the cables are ribbon-like, “flat” type, which is the reasonable choice considering that the PSU may be installed in very confined spaces where every millimeter counts. Be warned that these cables are much shorter than those of a regular ATX unit, with the ATX cable being just 30 cm (11.8") long and the PCI-E/EPS cables only 40 cm (15.75") long. Every cable is made of black wires and black connectors. SFX-L is the way to go, as these regular SFX-PSUs do struggle with thermal issues due to the small 80mm fan used. 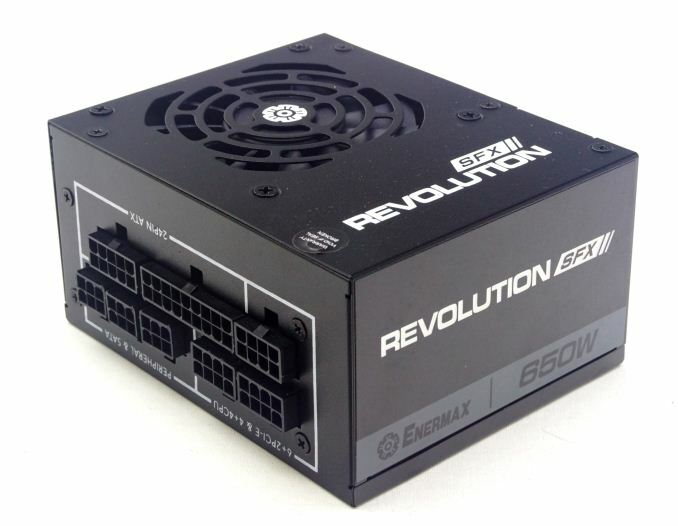 I have an Enermax Revolution SFX 650 power supply in an NCASE M1. 4. An EK XTOP REVO D5 PWM Plexi Pump. I am using a "SATA converts to right angle SATA + molex pin" adapter to split one of the SATA power points between fan splitter and the pump. My question is, is the SATA power cable sufficient to supply the power, or am I at risk? I went this route because the pump needs a molex connector, and adding the molex cable would be quite messy inside the case, especially because I have a custom cpu + GPU water loop in there with a 240 rad.